Some say three’s a crowd. But in the FE160 Crew Cab, seven can sit comfortably, arriving at the job site rested and ready. The clutter-free floor and spacious interior accommodate the bulkiest shoulders, legs and elbows. And there’s plenty more room behind the cab for equipment, payload and bodies up to 20 feet long. A boost for your business and your bottom line. 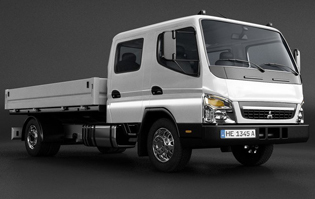 The Canter® FE160 Crew Cab will change the way you think about moving your company forward. Its cost-of-ownership is so low you can measure it by the mile—in dramatically improved fuel economy, service intervals, payload capacity and productivity. It seats seven. 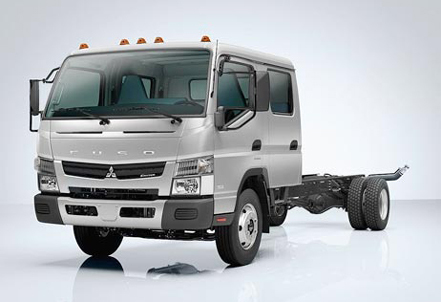 Its fuel-injected diesel engine and automated manual transmission set new benchmarks for efficiency and driving ease. 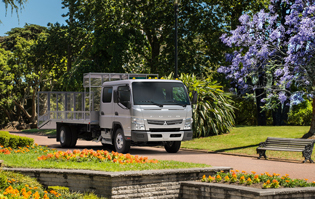 They’re backed by our industrybest 5-Year/175,000-Mile powertrain limited warranty.The Canter FE160 Crew Cab. It’s just the boost your business needs. Crush bar in each door, energy-absorbing steering column, daytime running lights, dual-caliper disc brakes with ABS (all wheels), covered open-grate entry steps, forward-swing doors for safer entry/exit, high visibility haloen headlamps, Engine Protection System.